Using the toolbox at WordPress.com, we will create a structure for your website in the form of a basic blog using two core elements: pages (for permanent information) and posts (for opinion, news, commentary, explanations). Add media and links to pages and posts to punctuate your text. We can work together over the phone since I will see your progress LIVE as you create and update your content. OfficeTradecraft.com uses WordPress, employing one of their hundreds of free “themes” that dictate the layout of your pages and posts (current choice: Bosco). Within minutes we can create simple content which we will test against the available themes. By reviewing LIVE on full screen and mobile device(s), we find the look and feel that styles your information with minimal juggling. Work with it for a while, change it again. You can view a theme in half a minute. Pick any theme and your contents will pour into it automatically. Don’t like it? Don’t activate it. It’s a click-on, click-off instant view of your site reorganized. I can teach you the fundamentals of WordPress.com in about three hours: from full-stop novice to controlling a live interlinked site of your own creation with at least three simple pages and three short posts à la the sample above. Keep the site concept simple: selling candles, sharing recipes, cataloging your shoes. Prerequisite: you have general composition skills at the keyboard and actually prepare six ‘page and post elements’ in Word similar to the list above that apply to your own site; have access to graphics or links in digital form or we will use online sample media. We can use one of my tutorial-domains for the work, or you may acquire one free directly from WordPress.com for yourself. There are many more WordPress features to explore once you’ve got a handle on the basics, including “nesting” your pages so the PARENT page appears on the Menu and additional pages appear in a drop-down list when the parent page is selected. You control this powerful option with a simple menu. 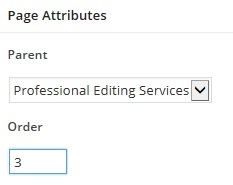 We place the “Manuscript Edit” option under the Services. You can continue nesting pages to create a complex catalog or text collection. Select the Parent page. Declare where in the Order this new sub-page appears, if you leave it at the default 0, then page order is determined by the theme. There are great tutorials online, too. We can pursue advanced options like transferring your existing web traffic to the WordPress format you’ve created and working on Search Engine Optimization. If this is an internal resource, like a company blog for shared information, then SEO is irrelevant but good category definition will pay off. WordPress.org is for developers FYI. Many more tools, many more options, many more mistakes to be made… and corrected.